Table Filters displayed records by table name. Only tables which are part of the restore set are listed. All — show all records. Inserted — show records that were inserted into Salesforce. Updated — show records that were updated in Salesforce. Skipped — show records that were skipped by CopyStorm. Clicking on the status value will display a popup with the skipped reason. Pending — show records waiting to be inserted or updated in Salesforce. Filter Lists all columns which support filtering by text. Contains — show any record containing the filter string. Equals — show any record matching the filter string exactly (case insensitive). StartsWith — show any records starting with the string. Apply Causes the current filter to be applied to the data. 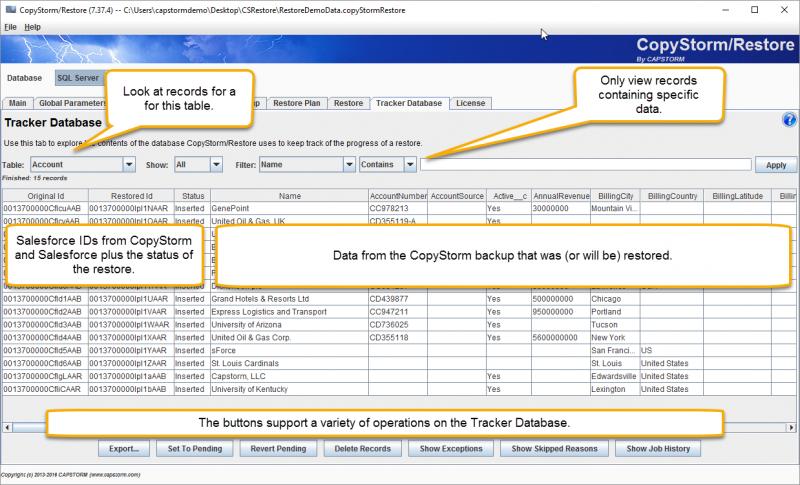 The middle part of the dialog shows the status of each record and the corresponding data from the CopyStorm backup. The first three columns contain tracking data for each record, the remaining columns contain record data from the CopyStorm backup. The “Name” column always appears first, other columns appear in alphabetical order. Original Id The unique Salesforce Id for the record in the CopyStorm backup. Restored Id The Salesforce Id the record was restored to in Salesforce. If the record was restored via an update, the value will be the same as the Original Id. Otherwise the value will be different. Inserted — this record has been added to Salesforce as a new record. Updated — this record has been added to Salesforce by updating an existing record. Skipped — this record was not restored to Salesforce. Click on the status to view the underlying reason. Pending — this record is waiting to be restored. The Tracker Database can be queried directly using tools like SQuirreL, or any other H2 database browser. Database schema documentation can be found here.